MONTELLO, Wis. — No cows, no cropland, but there’s plenty of protein and nutritious leafy greens. That’s what aquaponics offers. A cutting-edge hybridization of aquaculture and hydroponics, aquaponics combines indoor rearing of fish with soil-less plant production. At the University of Wisconsin-Stevens Point it’s called a transformational, global-agriculture business practice that ranges from home-food production to large-scale commercial food-fish farming. 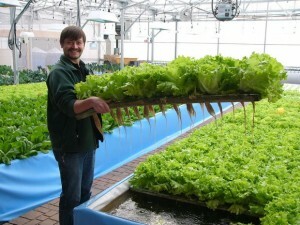 Wisconsin is leading the way in a “Blue Revolution” with the Aquaponics Innovation Center — a partnership between the University of Wisconsin-Stevens Point and Nelson and Pade Inc.®, a designer and provider of aquaponics systems worldwide. The Aquaponics Innovation Center at Montello opened April 2015 at Nelson and Pade’s headquarters. The 4,800-square-foot, state-of-the-art, controlled-environment greenhouse supports aquaponics research and is a focal point for university coursework. Equipped with six fish-production and soil-less plant-production systems, the center is designed for replicated research. 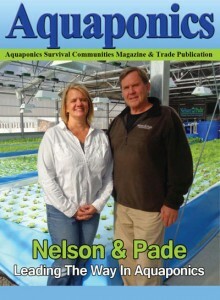 Nelson and Pade, Inc.® was featured on the cover of Aquaponics Survival Communities Magazine in the January, 2016 issue. Rebecca Nelson, co-founder of Nelson and Pade, Inc.® and the author of the article, also shares tips for success in aquaponics.